This publication is free to download for registered users of this website. 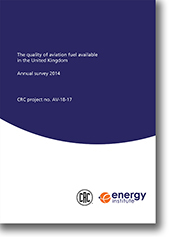 This report, jointly funded by the Coordinating Research Council (CRC) and the Energy Institute (EI), contains a summary of the data relating to the specification properties for AVTUR (Jet A-1) supplied in the United Kingdom during 2014. The data, which have been supplied by oil companies and associated test houses for main batches of aviation fuel released during 2014, are expressed in the form of histograms and mean values graphically compared over the period 1986–2014. This report is the 37th in a series of survey reports.